Palikir, Pohnpei—On May 28th, 2018, Mr. Ryoichi Horie, Ambassador of Japan to the Federated States of Micronesia and The Hon. Mr. Lorin S. Robert, Secretary of Department of Foreign Affairs, signed an Exchange of Notes for Grant Aid for Economic and Social Development Program in Palikir. 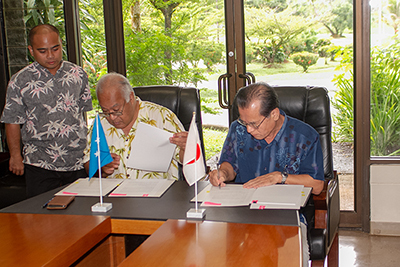 The 200 million Japanese Yen (approximately 1.8 million US dollars) will provide equipment to strengthen the FSM’s disaster prevention and disaster reduction capacity. The grant was announced on May 18th, by Prime Minister Abe during the summit meeting between Prime Minister Abe and H.E. Mr. Peter Martin Christian, President of the Federated States of Micronesia, who visited Iwaki, Fukushima prefecture, Japan to attend the 8th Pacific Islands Leaders Meeting (PALM8).